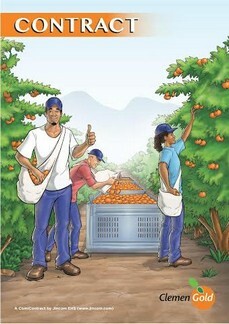 Exploring innovative ways in which to make contracts easier to understand for farm workers, Indigo Fruit Growers who produce, pack and supply Clemengold™ mandarins to the local and international market, is championing change in the industry by offering their fruit picking employees the world’s first Comic Contracts. Comic Contracts® have been especially designed to address the needs of vulnerable employees: employees who either cannot read well or have difficulties understanding the language in which the contract is written. Whilst the legal system requires that all employees have an employment contract, it assumes that everyone can read proficiently and understand the contractual terms presented to them. However, this is rarely the case in South Africa. Especially in sectors employing low-skill workers (agriculture, mining, manufacturing, domestic workers), employees are rarely in a position to understand – or question – the contracts that they are given to sign. For Robert de Rooy, “the way in which most contracts are drafted and presented (‘this is standard, sign it or leave it’) does not support a good relationship. Most employees don’t read it, nor would they be able to understand it if they tried.” This situation is perpetuating the power imbalance between employers and employees. Employees are bound to terms which they don’t understand, can't live up to, and cannot use to hold their employers accountable. In such circumstances, misunderstanding and conflict in the workplace should come as no surprise. Employing many workers who fall into the vulnerable category, Indigo Fruit Growers (part of the larger ANB Investments Group) felt it was important to address the contractual imbalance in the employer-employee relationship. “We are really excited about the transparency this contract brings to our employee relations. It creates a more equitable situation, which can only be the start of a more ‘honest’ relationship with our employees. I believe that workers can only commit fully to the content of a contract if they understand what they are signing,” says Abs van Rooyen, CEO of ANB Investments. Indigo recently initiated the implementation of the Comic Contracts®. First, the contract was presented to 50 fruit-pickers who had previously worked for Indigo. Following the successful induction of these 50 workers, the contract was presented the next day to a further 163 fruit-pickers. Commenting on the process, Faan Kruger, farm manager of Indigo Fruit Growers says: “The feedback was positive. No picker asked for the old contract. Although everything was new and there were many questions, the process went much faster than with a traditional contract”.